Desir Group – Blog: Move from Good to Great! At the beginning of each New Year, organizations explore new aspirations and possibilities. 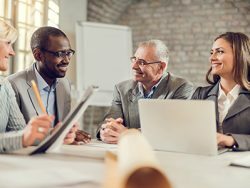 Leaders begin to connect the dots between the organization’s vision, strategies, plans and budgets and determining how to build a winning team. We are told that good leaders are trailblazers, making a path for others to follow. Great leaders, however, inspire their people to reach higher, dream bigger, and achieve greater. Perhaps the most important leadership skill you can develop is the ability to provide inspiration to your team. If you inspire them to reach for the stars, they just might bring you back the moon. 1. Ensure that you have a strategic HR leadership team – often senior management is unaware of real gaps in the recruiting and selection process. 2. Establish recruitment, selection and retention process that invites diversity and is fair and equitable. 3. Create a culture of learning through training, development, mentoring and coaching must be as important to maximize employee potential. 4. Promote cultural competence and understanding of the different generations on the work team, especially millennials. 5. Foster a culture of entrepreneurship – when employees feel empowered, they go the extra mile and perform to their full potential. Great organizations triumph over time. Moving from good to great requires understanding that the relationship between employee attitude and performance truly creates the greatest competitive advantage.